This is a guest post by Paladin blogger Honorshammer of HonorÃ¢â‚¬â„¢s Code. General Vezax is the the last boss you must down before you cross swords with Yogg-Saron himself. The General is one of most challenging fights in all of Ulduar due to his Aura of Despair. What is it that this lovely gift from the Developers does? Aura of Despair – Prevents mana regeneration throughout the fight by all means, except for Judgments of the Wise, Spiritual Attunement, Aspect of the Viper, Thrill of the Hunt, and Shamanistic Rage. Note that unlike the Play Test Realm version of this encounter Mana Potions and active abilities such as Evocation and Life Tap will not function. My guild recently downed General Vezax. I was Retribution for the fight, but when one of our healers went down; I jumped in and started throwing some heals on the tank. ThatÃ¢â‚¬â„¢s when I discovered the power of Judgments of the Wise for this fight. By Judging and stopcasting I was able to take over the 3rd healer role and concentrate on helping to keep our Main Tank alive, and do it on a Ret PaladinÃ¢â‚¬â„¢s mana pool. What exactly does Judgement of the Wise do? The replenishment aspect is useless. After reviewing the WoW Web Stats, I can see that I never gained Replenishment. However I did gain over 100,000 mana from Judgments of the wise! Because it works off base mana, it would restore the same amount regardless of the current mana pool of the Paladin. We know that for a Level 80 Paladin, Holy Light cost 1,274 mana. So with a little napkin math, we can conclude that I regenerated enough mana from Judgments of the Wise to cast over 70 Holy Lights. 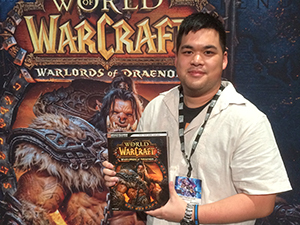 ThatÃ¢â‚¬â„¢s without the use of any Saronite Vapors at all. How practical would it be it for a Holy Paladin to get Judgement of the Wise? LetÃ¢â‚¬â„¢s look at a talents build that allows a Holy Paladin to get Judgement of the Wise, and the tradeoffs it makes to get there. 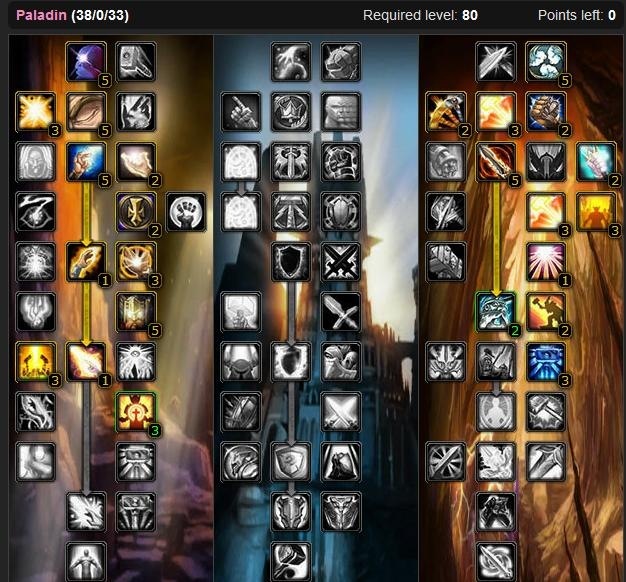 The most popular Holy Paladin build according to TalentChic is 51/5/15. LetÃ¢â‚¬â„¢s look at what is needed to turn that into our hybrid build. First off, the 5 points in Divinity have to go. Divinity is a really strong Tier 1 talent, but we simply wonÃ¢â‚¬â„¢t have room for it in our build. It doesnÃ¢â‚¬â„¢t matter how hard the heal hits if you donÃ¢â‚¬â„¢t have the mana to cast it. Those 5 points move into Sanctity of Battle and Pursuit of Justice. Sanctity gives you even more crit for your Holy spells which should offset some of the loss of Divinity. There is a ton of movement on General Vezax so Pursuit of Justice is really nice as you move away from a Shadow Crash or into a Saronite Vapor. Then we take the points out of Beacon of Light. This is one tank fight. Let the other healers handle the Raid; you can stay on the Tank so Beacon is a minor loss. You are going to lose the Haste from Judgments of the Pure and Infusion of Light. You will also have to heal from melee range because you wonÃ¢â‚¬â„¢t have the range increase from Enlightened Judgments. We had our Resto Druid healing from near melee range, so we could just have just as easily had a Holy Paladin there. You wonÃ¢â‚¬â„¢t have the mana reduction from Divine Illumination. Based on General VexaxÃ¢â‚¬â„¢s enrage timer, you would only be able to fire Divine Illumination more than 3 times during the fight. Are those 45 seconds of reduced cost worth the mana you can get back from Judgments of the Wise? Assuming a little haste from gear, weÃ¢â‚¬â„¢ll call Holy Light a 2 second cast. In those 45 seconds, we can get off 22.5 Holy Lights. To give every advantage to Divine Illumination, weÃ¢â‚¬â„¢ll call it 23. Holy Light costs 1271 so half itÃ¢â‚¬â„¢s cost is 635. So weÃ¢â‚¬â„¢ve saved 635 mana times 23 casts or about 15,000 mana. ItÃ¢â‚¬â„¢s about 10% of what Judgments of the Wise gives you. So Divine Illumination is gone as well. Bu-bye! Our final move is to take 2 points out of Holy Guildance which will result in about a 4% loss of spell power from Intellect. The rest of the Holy Paladin build is pretty much intact. With these points freed up, we continue to ascend the Ret Tree. The next point taken in Ret is Sanctified Retribution. This will increase all damage done by everyone near us, even if we are running Concentration Aura. We want to pick up Improved Judgments so we can judge as often as possible, and trigger Judgments of the Wise as often as possible. Now we need two Ã¢â‚¬ËœfillerÃ¢â‚¬â„¢ points to move into the next Tier. There arenÃ¢â‚¬â„¢t any great places to put them. I chose to put them in Crusade to increase the damage of Judgment by 3%. This build relies on judging often, so you might as well have them hit a little harder. On the next tier, we grab Divine Purpose. The 4% spell miss will act as increased resistance to Shadow Crash and Searing Flames should one get through your interrupters. Here again we find ourselves two points short of the next tier and not really any good place to spend them. I opted for Vengeance. Maybe you could get a stack going and hit those Judgments a little harder. ItÃ¢â‚¬â„¢s a filler choice so anywhere you want to throw two points will probably work. Finally, we open Judgments of the Wise. 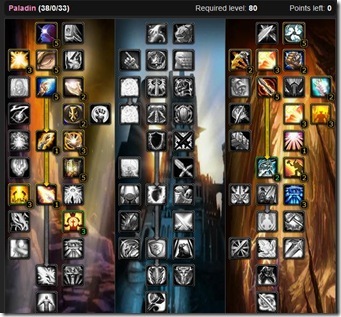 HereÃ¢â‚¬â„¢s the final 38/0/33 build in the WoWhead tool. General Vezax is a challenging fight. Specing for a specific fight is something that used to be fairly common in late Tier 6 and Sunwell. We didnÃ¢â‚¬â„¢t need it for Tier 7 raids, but as we near the end of Tier 8, it may be something to consider again. Tomorrow I will be out and about celebrating and counting down to New Year and all that fun stuff! I’m going to use what little time I have left today and tomorrow to finish up my new layout. It’s going to be simpler yet more functional. I hate coding. I transferred out of this profession years ago and having to modify this theme extensively for the past two months has reminded me why. With a New Year comes new resolutions! Much like Honors Code who recently published his goals, here’s my list of things to do for 2008. Those are my resolutions. What’s yours? I will see you all in 2008!